John Z. invited me over to his place over Christmas Week. When I got over there he showed me his hand-drawings of a simple cruising dinghy similar to the Sea Snark. (He owns a 28' cruising sailboat and wanted a QD - quick and dirty constructed dinghy to tow behind the sailboat on his trips.) We quickly decided to build a concept model that evening. I returned to my house to retrieve some thin cardboard and we went to work, cutting the cardboard, and putting the pieces together with a hot-melt glue gun. I mostly watched, held cardboard pieces together, and added my two cents worth at every decision tree. I call it a three-beer model because, in an hour and half of slapping this model together, I had two craft beers and John had one. The finished model was a simple flat bottom, slab sided hull. John has since taken the concept model and massaged it in a computer. He is planning construction when the weather turns warmer. The blogmeister holding the three-beer model. The sides of the model are thin pink foam that John sliced up using his new hot-wire foam cutter he designed and built. 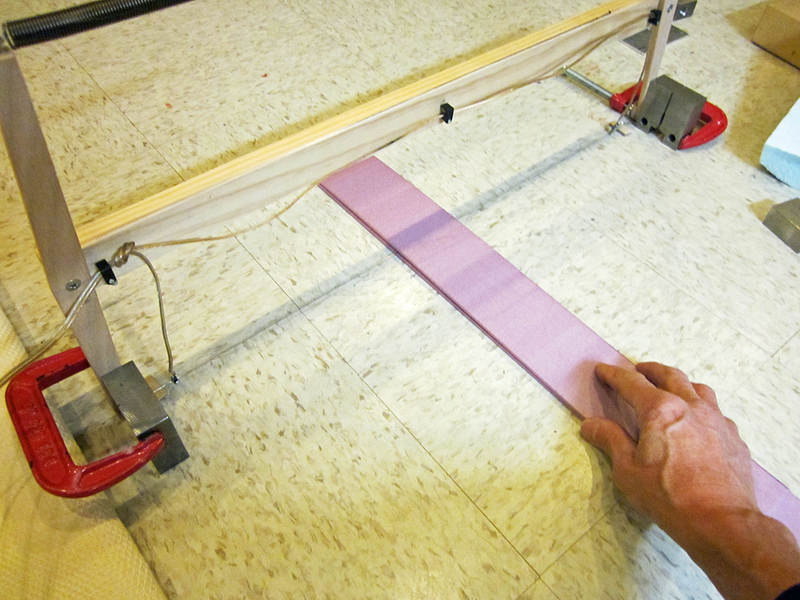 John cutting a thin sliver of foam using the floor as a base. The previous header photo was the side view of Crosby's Pup dinghy, a V-chine design published in the August 1938 issue of Rudder magazine. What is interesting about this design is Pup is one of the first dinghies designed to be built in plywood. Even more surprising is Crosby specified 1/8 inch (3 mm.) plywood for the hull and decks. Crosby seemed to have no fear, this early on, in pushing the structural limits by using very thin plywood. 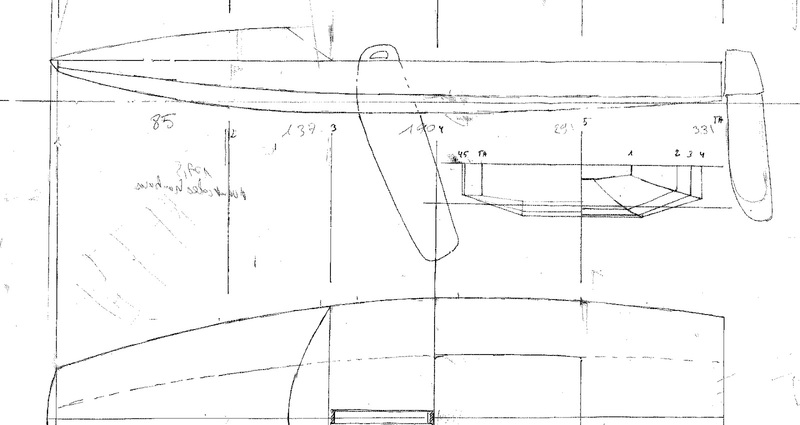 (Designers post WWII such as Phil Rhodes with his Penguin dinghy would revert back to the sturdier 1/4 inch (6 mm.) plywood for the hull.) To account for the flexibility of the plywood, Crosby added one fore and aft stringer and two smaller, intermediate frames between the major plywood frames. The Pup dinghy may be one of those "missing links" I am so fond of speculating about in sailing history. 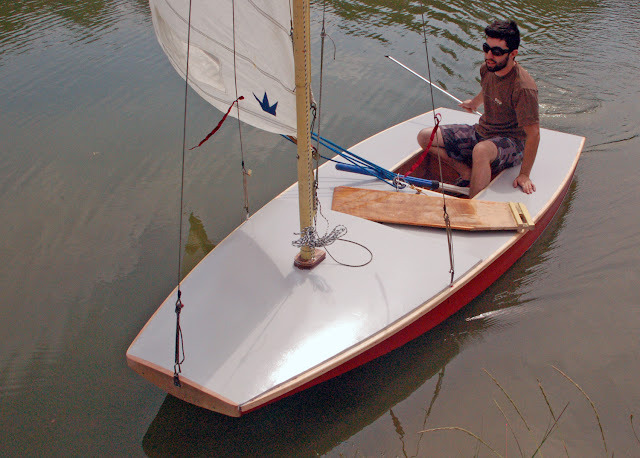 I have always wondered what spurred the Australians into wholesale acceptance of thin, lightweight plywood for their dinghies designed after WWII. (The Aussies would even convert their pre-WWII plank on frame designs before WWII over to light ply, their existing VJ class and 12 meter Olympic Sharpie.) I received an email from a South Australian dinghy sailor two years ago and he mentioned that he owned an Aussie Pup built by a local builder in the early 2000's. He also mentioned there was a sizable fleet of Pups in the Melbourne area in the 1940's but they had died out. 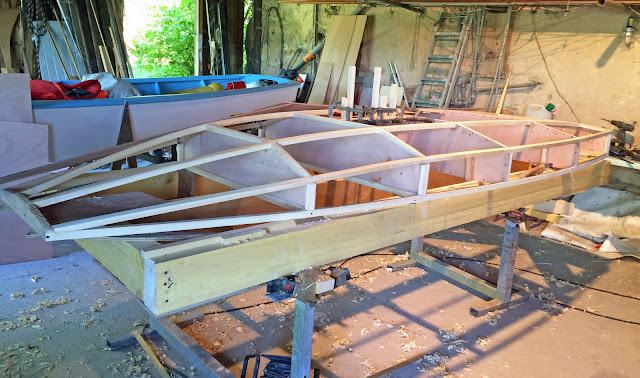 Could it be that some Melbourne sailors, in building the 1/8 inch ply Pup before World War II, would become the impetus of the Australian revolution in lightweight dinghies? Certainly South Australian Len Morris with his scow Moth would have taken notice as he would produce his superbly engineered, light plywood Mk II in the late 1940's. It would be an interesting slice of dinghy memorabilia if someone could dig up some photos of the Melbourne Pup fleet in the 1940's. For those that want more information, Steve Clark pointed out, in the comments section, the current builder of the Australian Pup has a Facebook page. 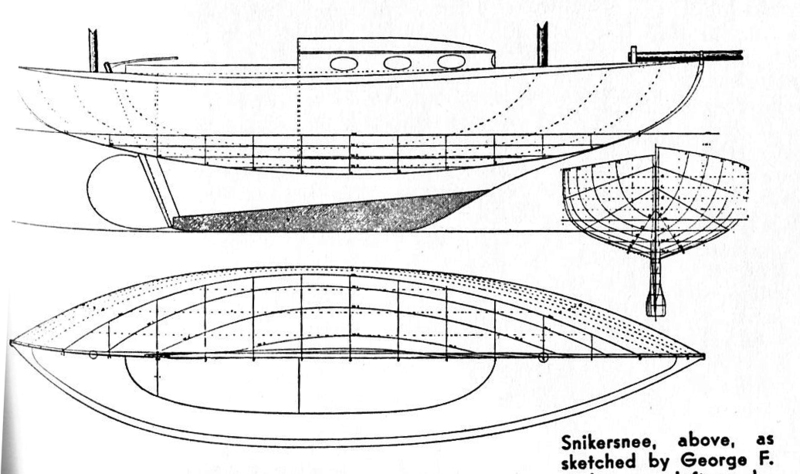 A JPEG file of the Pup plans as they appeared in Rudder magazine, 1938. Crosby and the Cricket class. The previous header photo was a side view of small cruising cutter of the early 1880's, designed by C.P. Kunhardt, then sailing editor of Forest and Stream magazine. By the Civil War, Americans had begun to cruise their native catboats along the East Coast. By the late 1870's, the importation of these English style cutters into New York City and, American designers following up with their own cutter designs, marked the acceleration of the proliferation of the pocket cruiser and the democratization of, what had been, a sport of the mega-rich with their massive yachts. 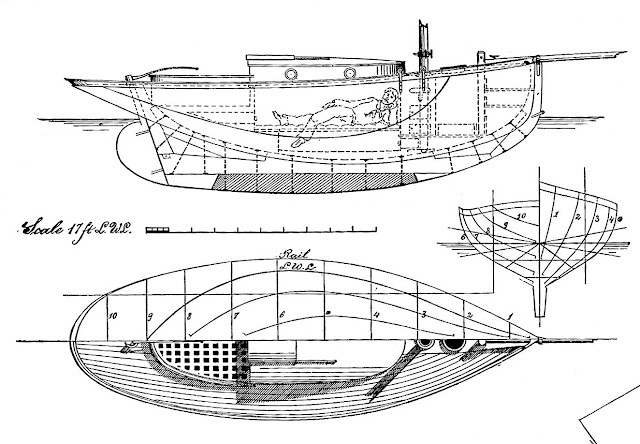 The appearance of these narrow beam, deep draft cutters, both small and large, also ignited a firestorm in the American yachting press, as nativists, in letter after letter to the editor, extolled the better cruising qualities of the beamier American shoal draft, centerboard designs, the catboat and the sharpie. As the sport entered the 1880's, three camps, the cutter and the two types of American shoal draft sailing craft, were building small cruisers of three widely disparate shapes to match the increasing demand of the well-to-do middle class. The lines to C.P. Kunhardt's pocket cutter cruiser. C.P. 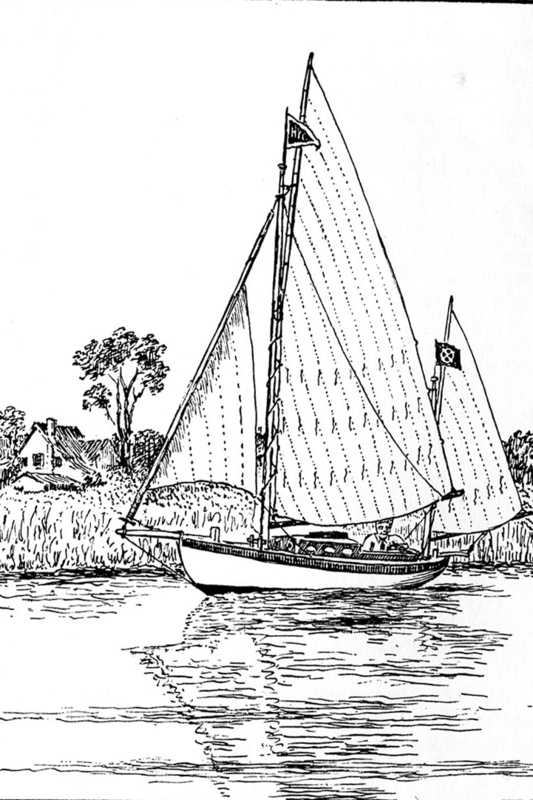 Kurnhardt, an early and vociferous proponent of the English cutter, later relented and tacitly admitted the abilities of the American craft when, in 1886, he designed a small centerboard catboat (shown below) which he took on a long cruise down the Eastern Seaboard. 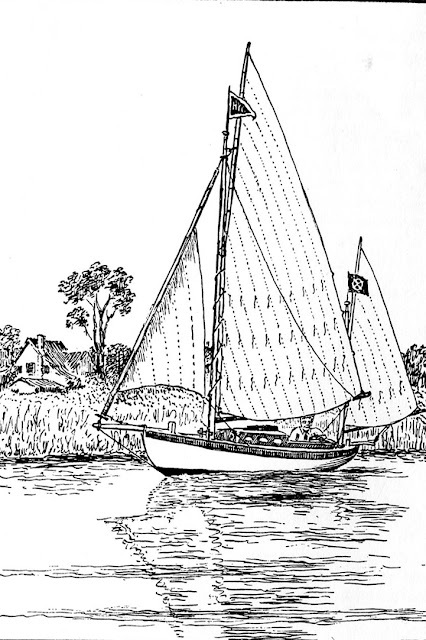 "The yacht Coquette beside the house was at one time owned by Mr. Whitlock; she was brought to New York in 1879 by Mr. Henry W. Eaton, a member of the Rowing Cub... Coquette was built at Southampton, England, in 1874 and was modeled closely after the single-handed yawl Rob Roy in which Capt. 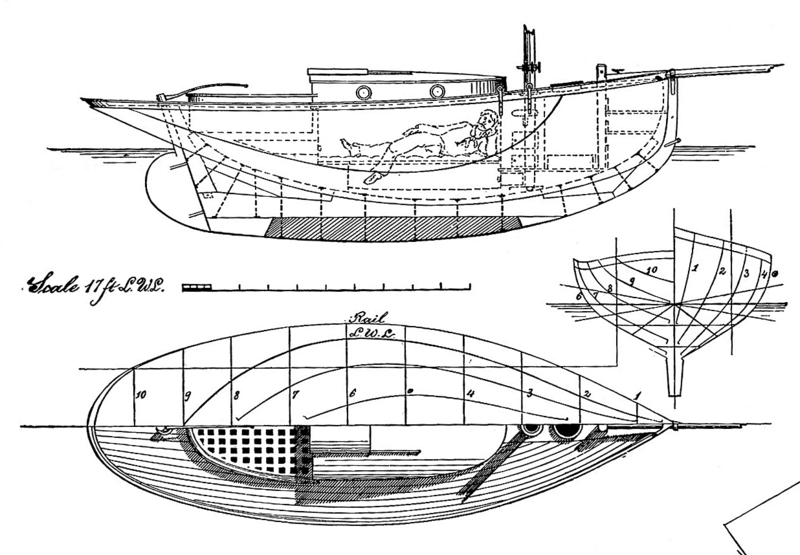 MacGregor cruised in 1867; she was 24 ft. over-all, 21 ft. waterline, 7 ft. breadth and 4 ft. draft. W.P. Stephens, who succeeded C.P. 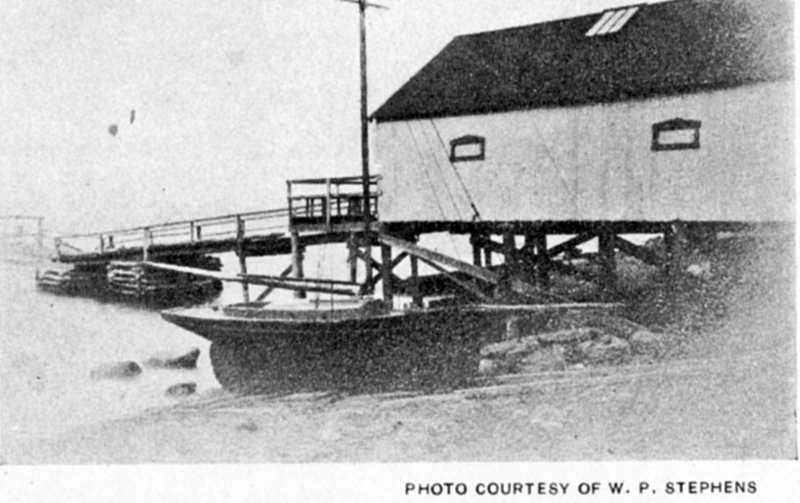 Kunhardt as sailing editor at Forest and Stream magazine, was also predisposed to the English type. 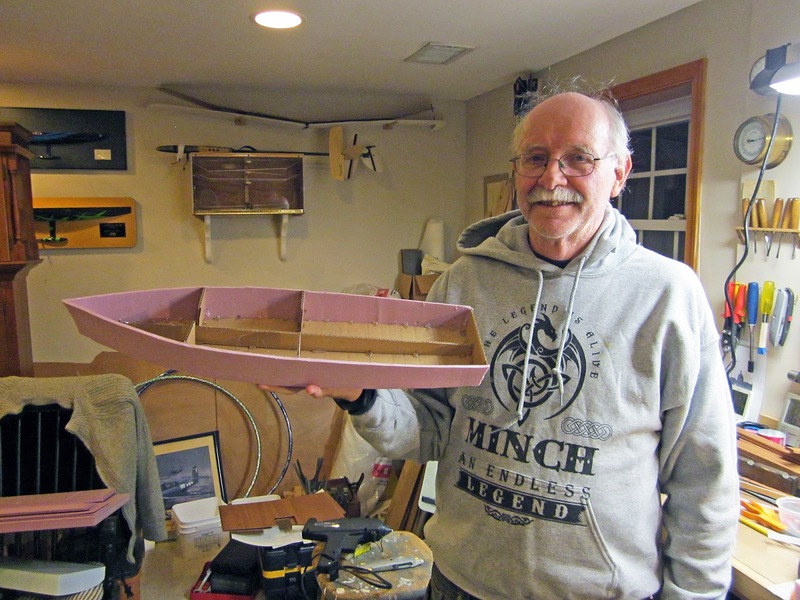 In 1898 when he designed and built his own pocket cruiser he went in a different direction, using the Humber canoe yawl as the basis for his canoe yawl, Snickersnee. This was not surprising given W.P. Stephens background as a designer and builder of canoes. A sketch of Snickersnee by George F. Holmes. Haul Away! Let's Hoist the Ballooner! A spinnaker hoist on a Fife cutter as seen from the vantage point of a jumper strut high up on the wood mainmast. A lot of canvas flying! Mariquita spinnaker hoist, "Poetry in motion". from Richard Sawle on Vimeo. This blog is mostly about small boat sailing but I have covered keelboats occasionally. For those in the depths of Northern Hemisphere winter, inside the house, with time on their hands, you can watch my previous keeler posts on Earwigoagin here. Bertrand Warion sent along his working drawing of the RazMoth II. 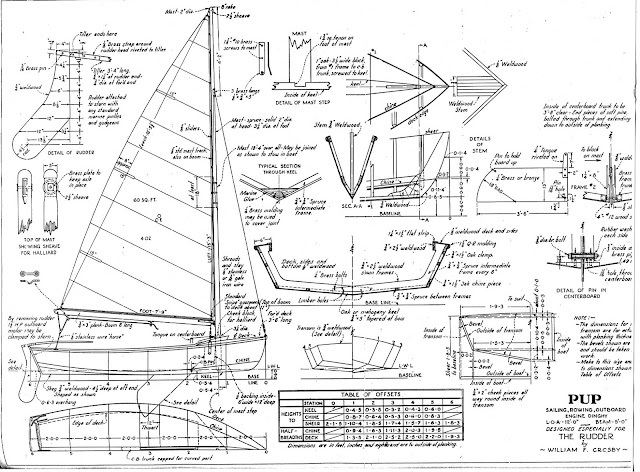 Lesser mortals would want more detailed plans, with scantlings and dimensions written on every piece of wood, but, for an experienced Moth boat builder, this is all you need to produce a working Mothboat. These drawings show the strong Fireball influence in this design. We also have in the Earwigoagin archives, the Mothball, a Moth dreamed up by Floridian Patrick Burger, who chopped off the back five feet from a Fireball to make a Moth. There is some similarity between the two. Station 1 - 85 cm. Station 2 - 137 cm. Station 3 - 190 cm. Station 4 - 261 cm. Another photo of the RazMoth II under sail with a storm brewing on the horizon. Andy Slavinskas, who lives just up the road in Philadelphia, has been doodling in 3D CAD and sends along some rendered drawings; three Classic Moths, with four different perspectives of each one. The first page is my own design, the Tweezer, a flat rocker U'd shape. 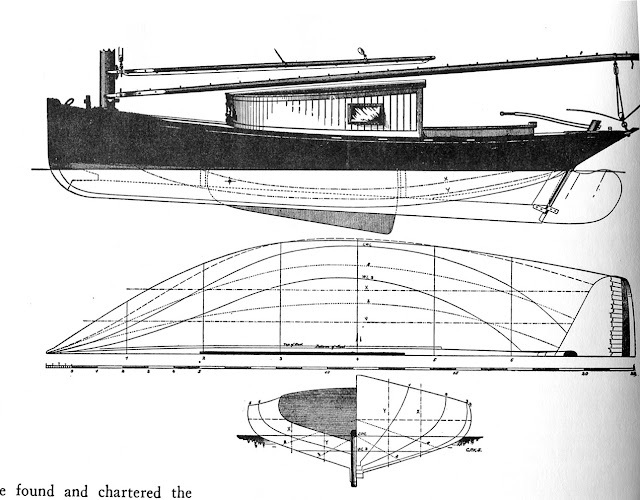 The second page is the race-winning (for Gen II), high rocker, V'eed hull shape of the Mistral. The third page is the more conventional sailing dinghy shape which is a consistent winner in our Gen I, the Europe Dinghy. Andy is doing all this work as a prelude to drawing up a Classic Moth he intends to build down the road. It will be very interesting to see what he comes up with. Given his expertise with computer drawing programs, this design will be well documented. "Mariposa is now out my mother's garden and back in my new home (it’s been 3 years,a lot of other work and lot of things to do). As soon I finish my home renovation (rebuilding another part of my home) I am thinking of building a new deck for Mariposa for a little more hiking comfort. 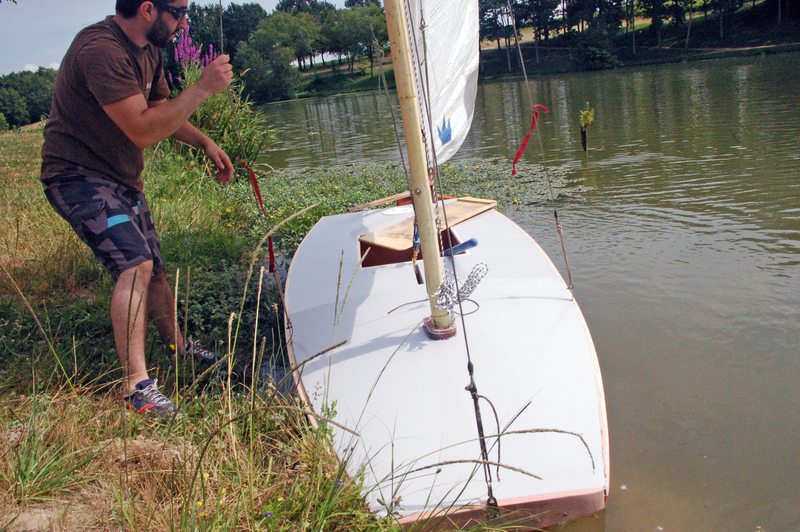 "This summer a new Classic Moth (RazMoth Mark II) was built in my backyard in 10 days. It was to a design previously built by myself in 2000/2002 with some modifications. 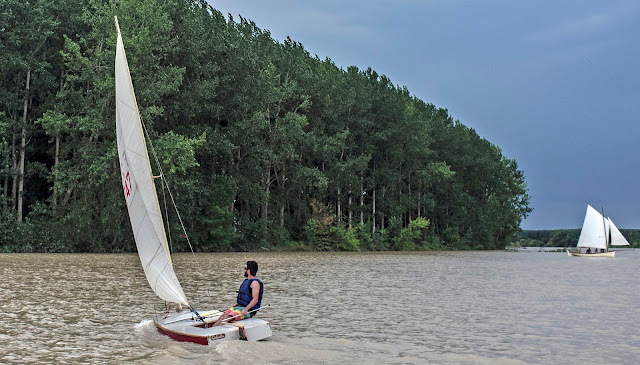 "The new owner is very happy with RazMoth Mk II (he is a surfer, not a sailor but learning rapidly). "This winter my young friend will build his own mast. (We were using Mariposa’s mast to begin with). It will probably be a free-standing mast (he is also a carpenter and joiner). Some photos of the Moth build. Setting up the frames. Only five including the transom. Laying in the stringers. 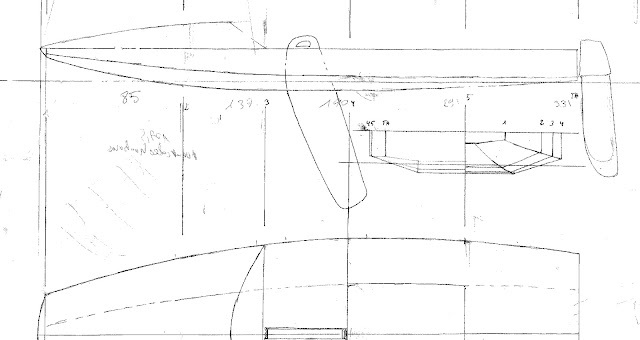 You can see the flat rocker panel and the multi-chine hull shape. Right side up without the intermediate plywood panel installed. Hull sides and flat rocker panel attached. Looks like Bertrand's backyard back up next to a vineyard. Now, that's cool! Sea trials for RazMoth Mk II at the "Duck Pond". I have the same color "Crocs". Must be something about crazy Classic Moth sailors. The original RazMoth Mk 1. "RazMoth Mk I in 2002. 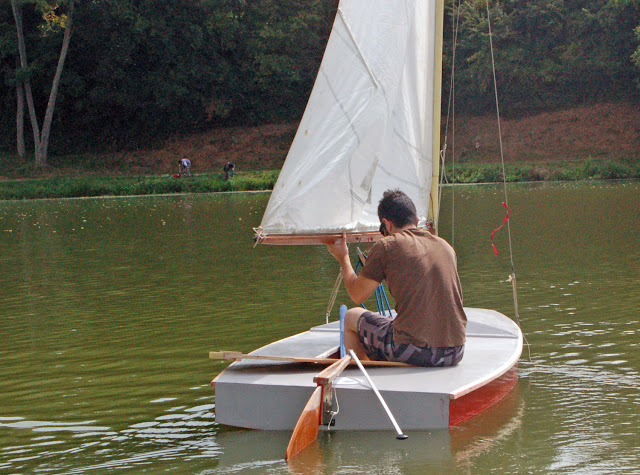 The boat was made of very low quality interior plywood and destructed 3 years later (really low cost boat). 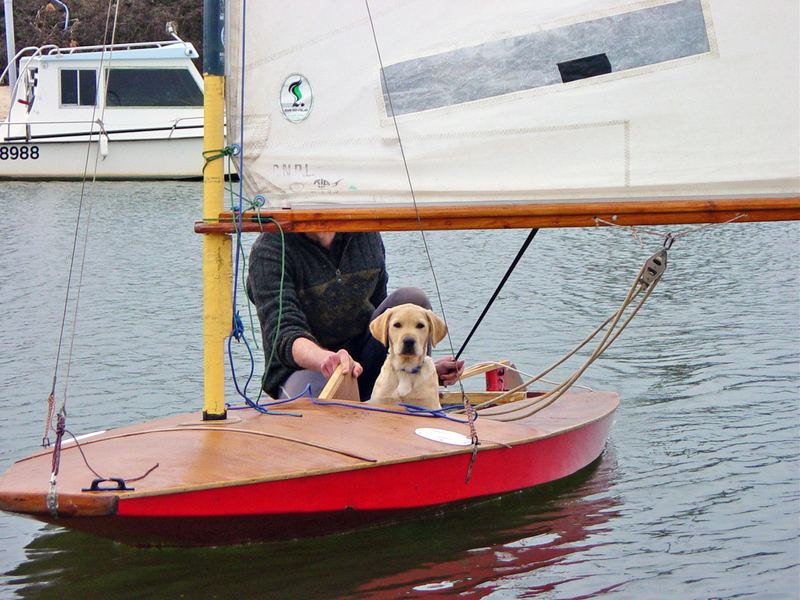 I sailed the first RazMoth with my great dog "Tango" (we were both young back then!)" Simple plans/drawing of the RazMoth.